Brian Wendel* joined the Vancouver Symphony Orchestra as Principal Trombone in 2017 at age 21. 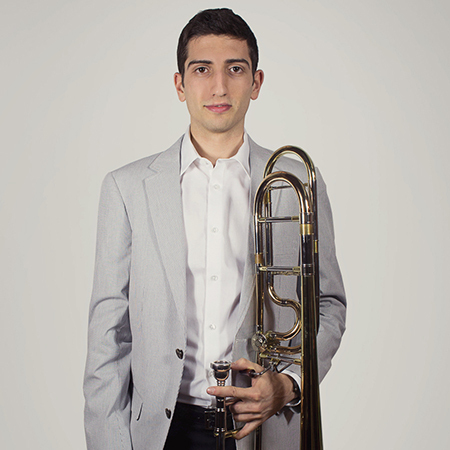 Winner of two International Trombone Association competitions (2014 and 2016), Brian has performed with the Philadelphia Orchestra, the New York Philharmonic, and the New York Philharmonic Brass Ensemble, and has appeared as a soloist with the Juilliard Trombone Choir. He has worked with conductors Yannick Nézet-Séguin, Valery Gergiev, Bramwell Tovey, Esa-Pekka Salonen, David Robertson, Alan Gilbert, Jaap Van Zweden, and Charles Dutoit, among others, performing in venues around the world. Brian received his bachelor’s degree from The Juilliard School, where he was a scholarship student of Joseph Alessi. In the realm of chamber music, performances have taken him to venues including the United Nations, the Russian Embassy in Washington, DC, and Madison Square Garden. He enjoys performing with the VSO Brass Quintet and engaging with audiences through a more intimate setting. As a student, Brian spent summer months as an orchestral fellow at the Music Academy of the West; Pacific Music Festival; American Institute for Musical Studies in Graz, Austria; the National Orchestral Institute; and the Alessi Seminar, and was an inaugural member of the 2013 National Youth Orchestra of the USA. Since joining the VSO, Brian has enjoyed teaching through the VSO Connects program, working with high schoolers throughout British Columbia. In summer 2018, Brian will join the faculty for the VSO’s orchestral training program, Whistler Institute. While at Juilliard, Brian served as a Trombone Mentor for Juilliard Pre-College, coaching the students of the low brass section. In addition to giving private lessons, Brian has also taught at the Washington Brass Institute Low-Brass Boot Camp alongside his mentor and former teacher, Professor Dave Sporny, and Washington, DC-based trombonist and teacher, Ken Wolff. Starting on the piano at age six and the trombone at age nine, Brian studied both classical and jazz music from an early age. Growing up in the rural town of Conway, Massachusetts, he was a student at the New England Conservatory Preparatory School in high school. Some of Brian’s early musical mentors include Norman Bolter, Andy Jaffe, and his dad, Renato Wendel. Outside of music, Brian loves to travel whenever and wherever he can, and has been enjoying the sensational nature of British Columbia. Brian performs on Edwards Instruments.